SQLyog provides all the tools you need to manage and navigate databases. Note that to start working with databases in SQLyog you need to connect to a MySQL server. 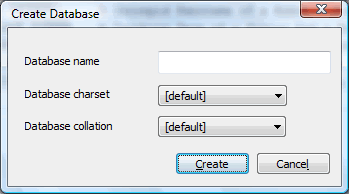 Select Database -> Create Database(Ctrl+D) or use the Object Browser context menu to create a new database. Enter the Database name and click Create button. The created database gets currently selected. The charset and collation options lets you define the default charset and collation for a database. Tables created in the database will be created with the selected charset and collation unless otherwise specified.